How do you like your mac & cheese? Super cheesy? With a crunchy topping? Uber creamy? Well this recipe may just be for you. I recently made this Creamy Macaroni & Cheese recipe and it was fabulous. 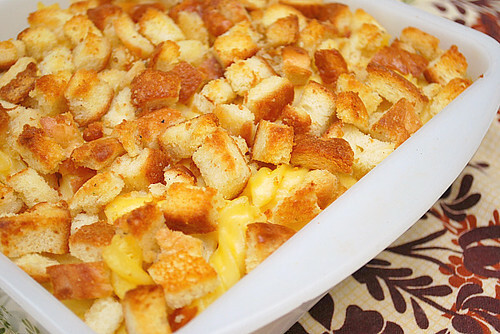 It had the perfect amount of cheese flavor, topped with buttery bread cubes for crunch and overall, a super creamy dish that beats any boxed version hands down! The recipe comes from Cook's Illustrated, one of my favorite sources for recipes since they test recipes until they are perfected. This mac & cheese recipe is no exception - it really is perfect! Both Monterey Jack and sharp cheddar cheese is used for a nice blend of cheeses. An optional hint of cayenne pepper is great for those that want a little kick. For the bread topping: cube 2-3 slices of good quality white bread. Toss with melted butter and saute in a pan over medium high heat until slightly toasted; set aside. Transfer mixture to a broiler-safe 9 by 13-inch baking dish and sprinkle evenly with bread cubes. Broil until crumbs are deep golden brown, 3 to 5 minutes, rotating pan if necessary for even browning. Cool about 5 minutes, then serve. I love Macaroni and cheese. This creamy version! Thanks for sharing! I really love it. That's pretty much how I make mine too, just without the bread topping - looks fabulous! I've never had mac & cheese with this type of bread topping. Bookmarked! What type of milk are you using? Whole milk? 1%, 2%, skim? Does it matter? This looks like great macaroni and cheese but I want to make sure I use the right type of milk. Thanks.